You might be wondering why I even bothered writing a review of Moonstruck, being that it is THE most typical slightly overpriced diner frequented by Murray Hillers. BUT, I happened to go to Moonstruck for lunch on Sunday afternoon and had a very pleasant experience that I wanted to share with all of you. With five locations scattered around Manhattan, Moonstruck does quite a business. And no matter how mediocre the food may be, if that’s the case, you continue to return because it’s in the neighborhood and you are guaranteed to see someone you know there EVERY SINGLE TIME. For example, this Sunday I went to Moonstruck with my family after Memory Walk. Though we were having a fairly late lunch, around 3:30pm, we ran into my roommate and her family. Seeing as I had not spoken to her earlier that day, this was quite the coincidence. In any case, I personally keep returning and ordering from Moonstruck because I think they have the BEST CHOPPED SALAD within a 10-15 block radius of Windsor Court, my beloved home. Moonstruck, at least the one on 31st Street and 3rd Avenue, is more than willing to customize your order (and with a smile) which is another very important reason I enjoy going there. But going back to the salad, it must be the finest chopped salad outside of The Great Dane in Madison, Wisconsin. And girls, you know what I’m talking about! And although Moonstruck’s salads might be slightly higher in price then their competitors, you are guaranteed to get two meals out of it! Though I must warn you that it becomes inedible after one day because it is so finely chopped, so make sure to eat your leftovers on day 2! I usually begin my order with the Fandango Salad or the Turkey Salad and then customize to fit what I’m craving on that particular day. 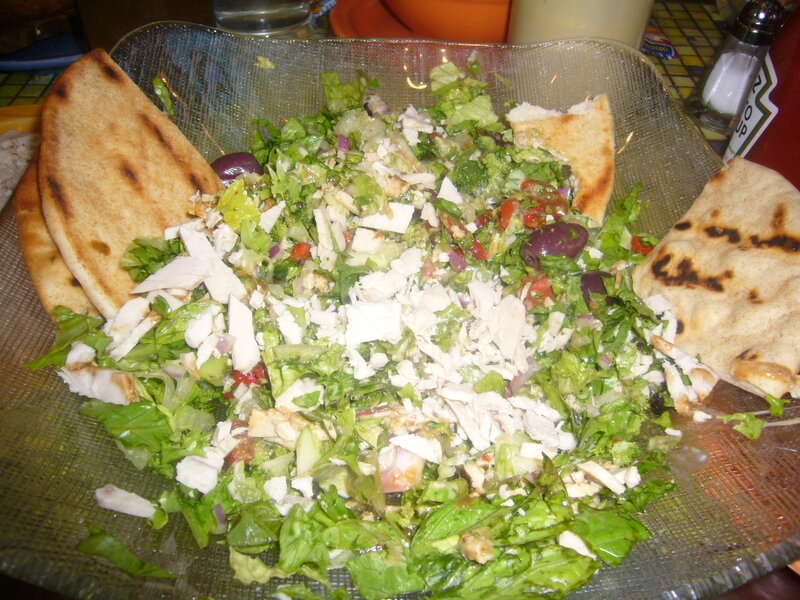 The Moonstruck salads come with a delicious side of toasted pita and dressing(s) of your choice. My staple dressings are the house balsamic vinaigrette and the honey mustard. I also love they way they serve the dressings, adding a Snapple cap to each bottle. Another great dish that Moonstruck serves up is their Tuna Salad Sandwich, which has the perfect amount of mayo. My dad ordered the Tuna over Pita with Greek Salad and it both looked and tasted fantastic! The rest of my family had chocolate chip pancakes, eggs, and matzoh ball soup which were all pretty standard though I do happen to like their soup very much. One thing I dislike though are their omelettes. Every single time I’ve ordered an omelette at Moonstruck it comes out watery. So steer clear of those! But definitely go for the salads!